Located on the island of Honshu is Japan’s third largest city, Osaka. The city is huge with a population of over 2.5 million people and is bustling with plenty of things to see in Osaka. with a population of over 2.5 million people in its greater metropolitan area. Osaka isn’t always located on the traditional Japan tourist trail like Kyoto and Tokyo, but it is full of life and things to do. Osaka has plenty of great restaurants, shopping, bars, and culturally interesting activities to keep visitors busy for at least a few days. Here you’ll find the 15 of the best things to do in Osaka. For centuries, Osaka has been the heart of Japan’s traditional Bunraku puppet theater. Making a visit to the National Bunraku Center is one of the many things to do in Osaka that shouldn’t be missed. It has a large hall seating over 700 and a smaller one seating more than 150, but if you think the seats don’t sell out quickly, you’d be wrong. A production of the Japan Arts Council, Bunraku is a performing art form which uses intricate puppets to entertain and tell a story. Though the traditional shows are nearly four hours long, don’t worry if that’s more time than you wanted to spend here, because tickets to individual acts are also available. The theatre is just a short walk from the subway, and if you happen to end up there on an off day, stop by anyway because they may let you check out the theatre and its famous puppet collection. The Japan Arts Council website has a English translation function, so look there for specific times, dates and pricing information. “Festival of the Gods” to us English speakers, Tenjin Matsuri is often referred to as the world’s biggest boat festival by proud Osakans. Though that claim hasn’t been confirmed, there’s no doubt that it’s a big one, and it’s Osaka’s largest festival of the summer season happening every July 24th and 25th. The Jaapanese have a reputation for being reserved and well-behaved, but Tenjin Matsuri is a time when many of them let their proverbial hair down. Celebrated for over 1,000 years, the festival includes fires lit aboard elaborately adorned riverboats in the evening, rituals, traditional dance, fireworks, and a parade comprised of thousands of revelers dressed in ancient garb. Considered one of the most important festivals in Japan, it’s especially important in Osaka and is held to honor Sugawara no Michizane – the god associated with astuteness and learning. Due to its geography, the island nation of Japan and its people have been seafarers and seafood lovers since the beginning of time. The sea is an integral part of their culture, hence the popularity of the Osaka Aquarium Kaiyukan. Considered one of Japan’s best aquariums – and one of the largest in the world – it’s located near Osaka Bay and contains fish, crustaceans, mollusks and marine mammals from around the world. The massive central tank is so large that it’s able to hold the world’s largest fish – the whale shark – which is closer in size to whales than it is to sharks and dwarfs even the mighty great white. The exhibits are clearly labeled in English, so you’ll be able to read and understand just what it is you’re looking at. Like most things in Osaka, it’s an easy walk from the subway station. Finding things to do in Osaka isn’t tough, but few of them capture Osaka’s essence better than the Sumiyoshi Taisha Temple. Also referred to as Sumiyoshi Grand Shrine, Sumiyoshi Taisha Temple is among the oldest Shinto shrines in Japan. Built in the 11th year of the 3rd Century, its aesthetic architecture is purely Japanese and free of any foreign influences, which may make it stand out among other Japanese temples to those with a discerning eye. The temple is considered the home of three deities who are purported to protect travelers, sailors, and fisherman. Still an active shrine site for the locals, it’s absolutely packed on New Year’s Day, when the Japanese come to present offerings, pay their respects, and ask the divine beings to aid and protect their loved ones. Though you probably didn’t fly halfway around the world to Osaka, Japan to spend your time learning about Swedish and Australian culture, that doesn’t mean a trip to the National Museum of Ethnology doesn’t deserve one of those precious spots on your itinerary. A tour of the National Museum of Ethnology may remind you that centuries ago, distant and unique people from all over the world were trading, fighting, and influencing one another’s cultures. The exhibits are full of fascinating artifacts, icons and even mundane and quirky items used in everyday life. There’s also a special audio room where you can listen to music from around the world. Located in Senri Expo Park, the museum is an easy walk from the subway. If going to a comedy club and seeing a routine in a language you don’t understand sounds like a great way to waste an evening, then fear not, because since 2011, ROR Comedy Club has been Osaka’s only English-speaking stand-up comedy club. Known as Japan’s, ‘Comedy Central,’ they’ve won excellence awards from a host of international travel sites, so you know it’ll be funny. On the other hand, since Osakans love a good laugh, why not throw caution to the wind and walk into one of the clubs where the routines are in Japanese. What better way to knock elbows with a few locals, drink yourself into oblivion and have a great time that you’ll remember for years to come. Remember, just laugh when everyone else does and you’ll be fine. It may seem a bit backward to visit an icon of American culture when vacationing in a unique and exotic country like Japan, but a trip to Universal Studios Japan may help reverse that bout of homesickness. Universal Studios is one of the best places to go in Osaka.Featuring exhibits from such timeless blockbusters as Jaws and Terminator, it’s a place that lovers of movies will appreciate. Much more than a boring exhibit of movie paraphernalia, the site is an amusement park too. The facility has been open since 2011 and was the fastest one in history to rack up 10 million visitors, which it did in its first year. There are special areas for kids full of lovable characters they’ll recognize, but the wait for rides at peak times can be excessive and the tickets aren’t cheap, so in order to get your money’s worth, try to go during non-peak times, weekdays, and days that aren’t bright and sunny. One of the greatest places of interest in Osaka is the Osaka Castle. Though Japan isn’t a country most people associate with castles, you’ll be surprised at just how many there are. Osaka Castle is one of the country’s largest and has seen its fair share of important historical events since it was built in the 16th Century. Built by the warlord Toyotomi Hideyoshi, who was an integral figure in the country’s unification, the current castle is a reproduction that was completed in the 90’s because the original was totally destroyed by Allied bombers in 1945. During World War II, the castle played a central role in Japan’s munitions industry, so became a high-priority target for aerial bombardment, but don’t worry, you’ll never know it’s not the original. You’ll still be impressed by the stalwart stone walls, moats, turrets, and architecture. There’s a fascinating and educational museum inside that will fill in all those important details too. It seems the more you travel, the more you realize that natural hot springs aren’t that rare. As a geologically active country, Japan is home to hundreds of hot springs – or ‘onsens,’ as they’re known in Japanese. Spa World is one of the world’s largest hot spring facilities and is divided into two floors – one for men and the other for women. The areas are decorated with themes from different countries and regions, including Asia, the Middle East, Africa, and Greece. Many spas in Japan – including Spa World – are open around the clock, to accommodate and cater to those with different schedules. There’s a gym, restaurant and water park on-site, and massages if the warm, therapeutic waters didn’t quite do the trick. Most of the signs are written in English in addition to Japanese, so make sure to read them, because they’ll tell you about proper onsen etiquette. Osaka Station City is a fantastic thing to see in Osaka. Bustling with tourists, commuters, and harried people of all stripes, Osaka Station City is a busy train station comprised of many different buildings. 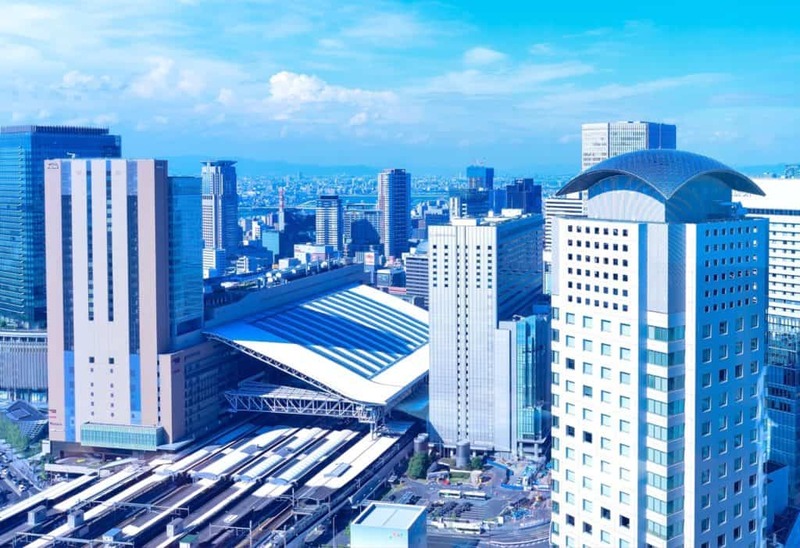 More than just another ho-hum train station though, Osaka Station City includes entertainment, retail, and dining areas, all of which are housed in a magnificent, contemporary, glass-topped building said to be the largest of its kind in Japan. It’s also one of Osaka’s busiest and trendiest shopping districts, comparable to even those found in Tokyo, according to many Japanese. For a great photogenic vista, head to the elevated bridge above the platform, which gives a bird’s eye view of the trains and tracks below. The station reportedly handles more than a million passengers a day and there are public spaces on the rooftop if you need to relax while waiting to catch your connecting train. Also called Nipponbashi, Den-Den Town is a shopping district in Osaka that’s famous for electronics and otaku – which is an often-derogatory term used to describe people whose interests in anime and other fetishes are borderline neurotic. The name became mainstream after one of Japan’s most infamous psychopaths and serial killers was dubbed the otaku murderer. The term is becoming less negative though, and the district has a reputation for an eclectic nerdiness which most find endearing. Due to the competition between electronics vendors, it’s okay and even expected that you’ll haggle over the price if you decide to buy something to take back with you. Located on Nakanoshima Island between the Dojima and Tosabori Rivers in central Osaka, the National Museum of Art is an underground facility also known as NMAO, or National Museum of Art Osaka. Though it’s a national museum, it has a decidedly international flare, partly because it was originally built to house an international art expo in 1970. The name of the famous Japanese architect who designed the museum probably won’t mean anything to you, but you’ll likely find his work impressive. The majority of the museum’s collections and exhibits are from the post-war era, and there are some exemplary works from world-renowned masters like Cezanne and Picasso as well. 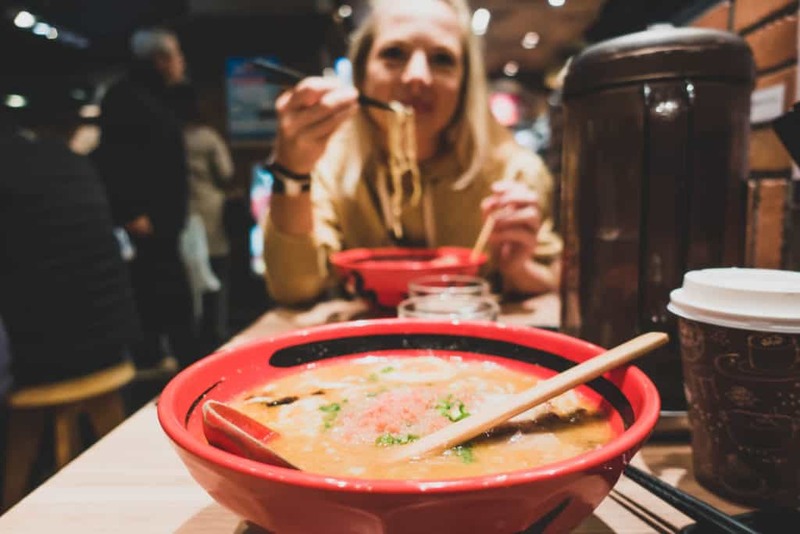 Japanese for “American Village,” America-Mura is a chic pocket of hipster-ridden coffee bars, shops, tattoo parlors, clubs and seedy hotels that cater to trysts between young lovers. Though you may not think it has much in common with any town in America you’ve ever visited, it got its name after World War II, when the devastated country began the slow process of rebuilding; this area was the place to go to get American goods like t-shirts, razors, and cigarettes. Sitting starkly in the middle of the village is a park constructed of concrete called Triangle Park, which is known as a rallying point preceding a night on the town. There are also many bold murals – some of which have been painted by famous, contemporary Japanese artists – and there’s even a pint-size Statue of Liberty if you’re feeling homesick or just want a quirky photo to show your jealous friends back home. Though the area is fun and lively, it’s not a great place for families after the sun goes down. 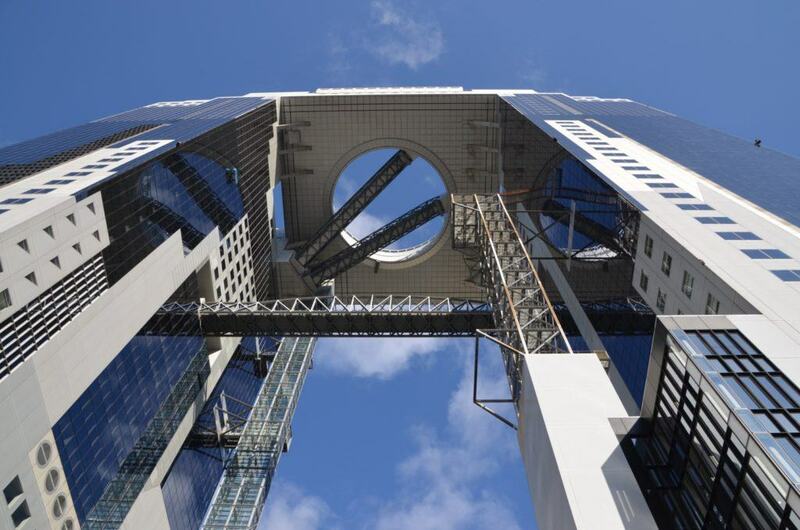 Google ‘Umeda Sky Building’ and take a look at the photos, then you’ll definitely want to make it one of the things to do in Osaka. Comprised of two towers connected with a massive observation span, it’s a great place to get vistas of the city that you won’t find elsewhere. Though not tall by modern skyscraper standards, the building’s magnificent architecture more than makes up for what it lacks in height. 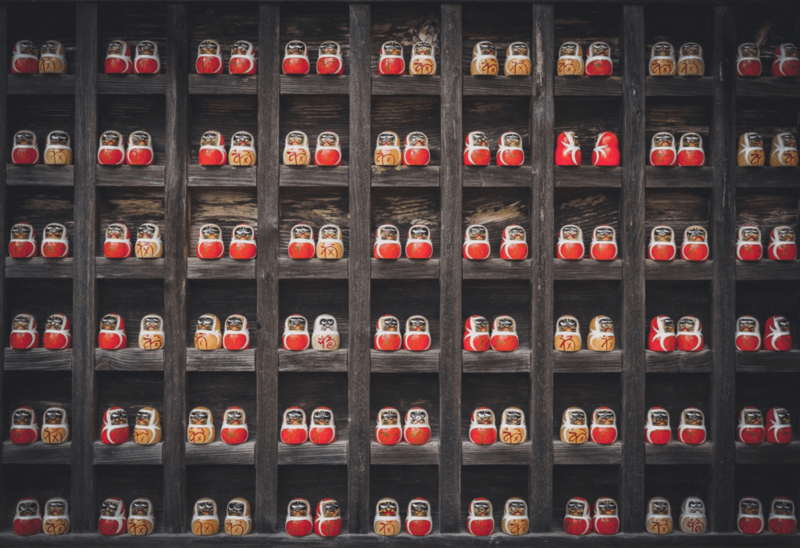 The building is also a magnet for Japanese couples, who have their names engraved on heart-shaped locks, then leave them at the top overlooking the city as a symbol of their love and commitment. In the building’s basement, there’s a restaurant designed to look like a typical street in Osaka about 100 years ago. If you’re looking for free things to do in Osaka then head to the park! Since you’ll already be on this wonderful island visiting the National Museum of Art, why not cool those hot heels and stick around a bit, because there’s a lot to see on this long, narrow island – like its historic government buildings, museums, and the promenade that runs along the riverfront. Like most things Japanese, they did a wonderful job combining the natural and manmade worlds into a pleasant and soothing environment. It’s a great place to take a relaxing stroll and look at the magnificent views of the city across the river too. Osaka has some fabulous Airbnb’s to choose from. To feel more at home we use Airbnb – you can check out some tips and read more about getting an Airbnb coupon code here. Or just take this coupon for your first stay! Residential Hotel is in the the Chuo Ward district just 1 km from Namba CITY shopping mall. I love this place because it is decorated in very traditional Japanese fashion. The Ritz Carlton Osaka is as gamourous as Ritz Carlton comes. It’s only a 5 minute walk from the main JR Osaka Station and has a Michelin star restaurant attached. If you’re visiting during the summer you will definitely want sunglasses in Japan. My favorites are made by Smith. The Chromapop lens technologyis like seeing the world with a fresh set of our eyes. They enhance contrast, reduce glare, and reflection for superb vision while driving, walking around town, or out on the water. We also love the style of the glasses for anyone who likes to live an active lifestyle. 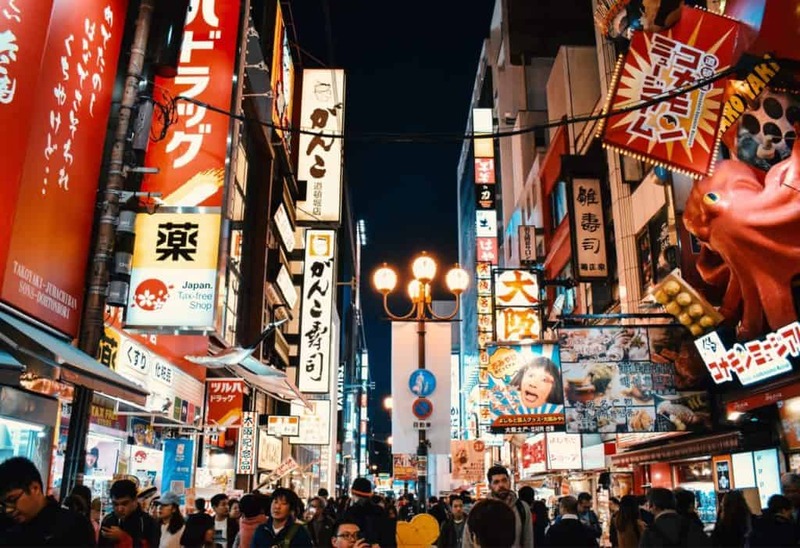 You’ll be doing a lot of walking in Japan especially if you are hanging out in cities like Tokyo, Kyoto, Sapporo, or Osaka. Make sure your feet don’t want to kill you and get a pair of good men’s walking shoes or women’s walking shoes. Chances are you’ll want a camera for your trip to Japan. Our favorite pocket-sized point and shoot camera for quick trips are the Sony RX100V. It takes fantastic photos and video and is the size of your palm. To up your photography game a bit consider the Fuji X-T3. We just bought that camera and find the images out of unbelievable. Check out our other travel cameras here. We never travel without travel insurance with World Nomads. World Nomads offers incredible flexible and great plans for Japan! All the wonderful reasons I love Japan!